Truth: Food-based multivitamins are made from minute amounts of dry foods plus synthetic vitamins that are sometimes cultured with yeast. While marketing claims often make one believe that food-based vitamins are derived from real food, the reality is quite different. First group consists of formulas made from synthetic vitamins and minerals cultured with a small amount of whole foods and yeast. The supplement facts panel of such multivitamins lists vitamins and minerals without specifying their exact forms. It also lists whole foods blend (often organic). You will see a statement like “Nutrients are created through cultivation”. This means that mostly synthetic forms of vitamins and minerals listed on the label were combined with minute amount of whole foods and cultured with yeast. After that the mixture was dried and put into tablets. Second group consists of formulas made from synthetic vitamins and minerals with addition of the small amount of whole foods. On the label you will see a list of vitamins and minerals with their forms specified, plus whole foods blend labeled as “green food blend”, “stress support blend”, or similar. Pay attention to the amounts of nutrients in such blends, they are very small and as such are mostly negligible. Truth: Amounts of whole foods that can be added to multivitamins are very small. Only highly concentrated standardized extracts can have a meaningful effect. Amounts of whole food concentrates that can be added to multivitamin formulas are very small. On the labels you will generally see between 100mg to 1000mg food complex, which is less than half a tea spoon. How much benefit can you get from eating such minute amount of dry spinach or raspberry? You would be better off after eating a couple of blueberries or a leaf of spinach. It is best to consume real fruits and vegetables. If supplementation with whole foods is needed, look for multivitamins with highly concentrated standardized extracts or even better high quality greens formula. Truth: Long term use of high doses of vitamins and minerals has not been sufficiently studied. Choose vitamin supplements with amounts of vitamins and minerals close to RDA (recommended daily amounts). As with many things, more is not always better. Long term effects of daily supplementation with mega doses of vitamins and minerals have not been sufficiently studied. Fat soluble vitamins and minerals can accumulate in the body and cause extra strain on elimination organs. In case of water soluble vitamins, the body can assimilate only so much, the rest has to be eliminated and can cause unnecessary stress on kidneys. If one desires to take high doses of vitamins and minerals it is best to do so under the guidance of qualified health care practitioner. Truth: Some vitamins and minerals should not be taken together. One should always pay attention to the interactions. Studies show that some vitamins and minerals can greatly inhibit absorption of one another. Examples include calcium and iron, magnesium and manganese, copper and zinc taken together. To maximize absorption, these vitamins should be taken at least 3-4 hours apart from each other. What good is it to take multivitamins if they won’t be properly absorbed? Truth: Some vitamins have an energizing effect on the body, while others have a relaxing effect. Certain foods can inhibit or enhance absorption of specific vitamins and minerals. Food and beverages can inhibit or enhance absorption of vitamins and minerals. For example, iron taken with coffee, tea or milk will be poorly absorbed (less than 20% absorption rate). Fat-soluble vitamins, coenzyme Q10 and carotenoids taken with a light fat-free snack will also be poorly absorbed. On the other hand, vitamin C greatly enhances iron absorption and fat greatly enhances absorption of all fat-soluble nutrients. Most multivitamins on the market are best taken with breakfast (if one eats breakfast) or lunch. Taking standard multivitamins in the evening might have an energizing effect and is generally not recommended. In essence all vitamins on the market are synthetic. However, there is a big difference between various synthetic vitamins. Some are identical to the ones our body makes and can be called “natural”, others are not. It is important to choose multivitamins based on the forms of the vitamins and minerals that they include. Easy ones to spot are vitamin D, which must be in D3 form (calciferol) and not D2. Vitamin E in a natural form is labeled with letter “d”, while synthetic form is labeled with “dl”. All minerals should be chelated. Do not buy vitamins that include oxides or sulfates of minerals since they are very poorly absorbed. The formulas that do not list the forms of vitamins and minerals that they include are a black box; you don’t know what you are getting. Don’t fall victim to marketing myths, there is no need to pay a fortune for food-based vitamins. Natalia Lukina holds an MS degree in Biology from Caltech and Drug Discovery and Development professional certification from UCSD. Natalia is the founder of Vital Formulas, a company that has developed patent-pending Balanced Trio multivitamins. Balanced Trio consists of three formulas – Morning, Mid-day and Evening and was formulated based on the latest research on vitamin interactions and dosage. Visit www.vital-formulas.com for more information. Q: In general, do people need to take a multi? The research on this topic is highly contradictory because on one hand, you have pharmaceutical companies funding research in order to discredit vitamin and mineral supplements, as they are the single biggest threat to their industry. On the other hand, there is a huge body of research documenting the effectiveness of vitamin and mineral supplementation on nearly every condition from cancer to arthritis to the common cold. Now, that being said, it is simply not possible to meet the RDI (recommended daily intake) for the various vitamins and minerals you need daily from foods alone, even on a highly optimized, highly specialized and restricted diet that focuses only on the most nutrient-dense superfoods. Furthermore, the difficulty (and expense) of maintaining a diet like this makes it non-feasible for the vast majority of people. Therefore, we recommend supplementing with a high-quality vitamin and mineral supplement for optimal health. Ideally you want to get as much of your daily nutrition as possible from whole, unprocessed foods, so this should be your first priority at all times, however, once you have incorporated this type of diet into your life, it couldn’t hurt to take a multivitamin as well to fill in the missing gaps. What we suggest is this: Get yourself a high quality multivitamin (see our recommendations below) and take it for a few weeks. If you feel better, then continue longterm taking a weekend off every month. If you feel worse, then stop. The critical thing here is to take a high quality multivitamin, as this makes all the difference. High quality multivitamins will have the best forms of the vitamins and minerals in the closest state to how they occur in food, which is best for maximum absorbability and compatibility with the body. Q: So how do I know if I should take a multivitamin? Pretty much everybody is a candidate for taking a multivitamin. The fact is that soils (even organic soils to an extent) have become highly depleted due to the intensive method of farming that has been in practice for the last 50 years or so. Soils are where our foods get their nutrients, whether its the fruits and vegetables that grow in them or the cows that eat the grass that grows in them. One way or another, everything comes back to soil health. Many experts estimate that pre-1950’s (before the advent of overly intensive, industrial farming practices), our food had nutrient levels 2-3x higher than they do now. Therefore, even for people eating a diet of 100% whole, unprocessed organic foods, it will be very difficult — if not impossible — to get all of their nutrition from foods alone. We believe just about everybody could benefit from supplementation with a high quality multivitamin. Q: Do vegetarians and vegans in particular need to take a multi? CALCIUM. This multifunctional mineral strengthens bones, clots blood, regulates the heart, helps the body use iron and wards off PMS. Obvious calcium sources are dairy products—milk, cheeses, yogurt—but getting enough calcium can be a problem for vegans. They can find ample calcium in certain dark green vegetables, soybeans, almonds, fortified soymilk, tempeh or tofu. VITAMIN D. This essential vitamin enhances the absorption of calcium, which helps fight bone loss. Vegans are especially vulnerable to not getting enough D. Fifteen minutes of sun exposure a day to the face and hands is often sufficient to get the D you need. But if the weather’s dreary and if fortified soymilk and cereal aren’t available, you can get D through a multi. ZINC. It fights infections and helps the body digest protein, produce energy and absorb vitamin A. Ironically, vegetarian males who consume otherwise healthful amounts of whole grains— which contain phytates, which bind zinc—could be at risk for low zinc intakes. Low zinc levels have been linked to low sperm counts, says Bruce Ames, PhD, a professor of molecular cell biology at the University of California, Berkeley. VITAMIN B12. It fights Alzheimer’s disease and multiple sclerosis, prevents anemia, promotes growth, maintains a healthy nervous system and reduces fatigue. Sources of vitamin B12 include nutritional yeast, cows’ milk, fortified soymilk, yogurt, eggs, fortified cereals and fortified meat substitutes such as veggie burgers. Because B12 is found in animal products, vegans probably don’t get enough of the vitamin; a multi will help. Q: How can I pick the right multi, considering my age, gender, etc? First, copper is abundant in the average diet and is one of the few minerals that does not need to be supplemented. Also, it can be dangerous if you get too much (and also hard to remove from the body), so it is best to avoid supplementation completely. A person who eats a well rounded, whole food diet will have no problem getting adequate levels of copper. Second, Iron should only really be supplemented by those who do not regularly eat red meat or oysters, pregnant women and vegans/vegetarians. Furthermore, high quality, food-based iron supplements exist that supply adequate levels of iron and these should be supplemented separately from a multivitamin to more tightly control the body’s levels (too much iron is as bad as too little, shoot for 7-10mg of heme-iron perday). Furthermore, synthetic iron is poorly absorbed and can even be detrimental in some cases. Finally, Iodine is very easy to get from whole foods (sea vegetables) or a whole food supplement, is inexpensive and may not be ideal if you have thyroid issues. Therefore it is important to supplement with this separately based on your unique needs. Q: What should I be looking for on a vitamin label? Look for logos from www.consumerlab.com and/or US Pharmacopeia (USP) to show that the multi has been tested for quality, strength, purity and good manufacturing practices. ConsumerLab.com is an independent, private organization that analyzes supplements to test that they actually contain what the label says in the amount listed. They also test for purity (lack of contaminants such as lead) and bioavailability (breakdown of the supplement to forms that the body can absorb). For the cost of membership to the ConsumerLab site ($24/year), you can check which supplements pass and fail these criteria. The USP helps to ensure that consumers receive quality medicines by establishing standards that pharmaceutical manufacturers must meet. Visit www.usp.org for more details. Q: What should I ignore on a label? Don’t choose a multivitamin for added extras, such as herbs. If you want to take these, you’re better off getting them separately (there’s a limited amount of stuff that can be packed into one multi). Just because a multivitamin contains one or more of these ingredients doesn’t mean the quantities are significant enough to have any effect. Also ignore marketing eye-catchers such as “stress formula,” “high potency” and “maximum.” Stress formula’ doesn’t mean it will help you deal with stress. Same thing for ‘energy’ phrases—extra vitamins don’t give you energy. ‘High potency’ and ‘maximum’— the latter has no legally defined meaning, by the way— also have little or no significance. 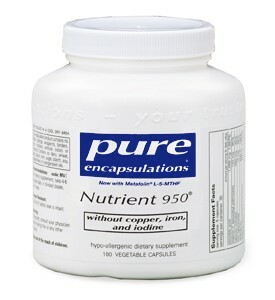 The only multivitamin that we can recommend in good conscience these days is Nutrient 950 with no Copper, Iron or Iodine, by Pure Encapsulations. Pure Encapsulations make the highest quality multivitamins on the market. They used to sell exclusively to qualified naturopathic doctors, but have since allowed the general public to begin ordering directly their products through various websites. To learn more about this product on the Pure Encapsulations website, click here.